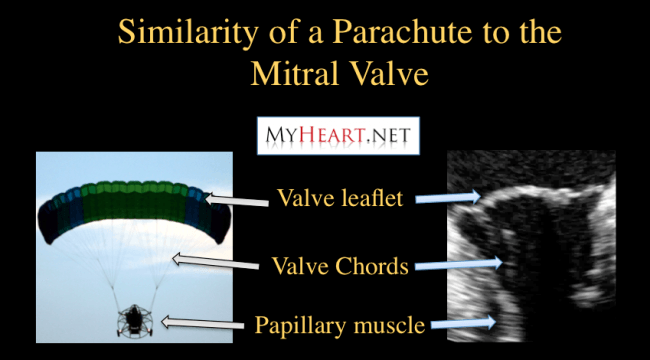 Think of the mitral valve in mitral valve prolapse as a parachute. The canopy of the parachute is rounded, like a mitral valve prolapse valve (where as in a normal valve it would be a flat top). The strings that connect the canopy to the person are like the ‘chordae’ that attach the valve to the heart muscle. Now imagine a set of the strings were to snap. The portion of the parachute attached to those strings would flail up in to the air. In the same way, when the chordae attaching the mitral valve leaflet to the heart snap, the leaflet becomes flail. 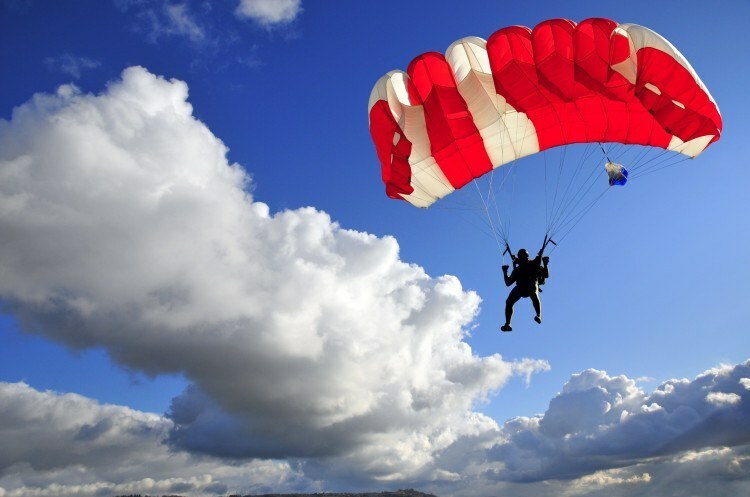 If the parachute were to be flail, it would no longer provide resistance to the air and fail. Similarly the flail mitral leaflet provides no resistance to stop blood flowing backwards and therefore leads to a severely leaky valve! The images below show classic flail leaflet. The chords that hold the leaflet to the heart muscle have snapped and as a result the leaflet has a flail portion that can be seen flying back up in to the top chamber. This leads to what we call a torrential leak of blood backwards in to the top chamber of the heart – the wrong direction! Why Does Flail Leaflet Happen? 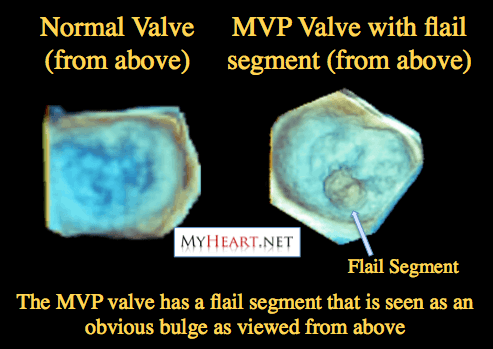 In the previous post in the blog we discussed the way the disease affects the valve in MVP leading to degeneration. The leaflet becomes thick and spongy and prolapses back in to the top chamber of the heart every time the heart squeezes. However it’s important to note that the chords (strings) that connect the valve to the heart wall also become weak because they also degenerate. In general they are only about as half as strong as normal chords, despite being under more stress than normal chords. This means the chords in MVP are prone to rupture. Of course when enough chords rupture they can no longer support the valve and thus we have a flail. Flail Leaflet – Now What? 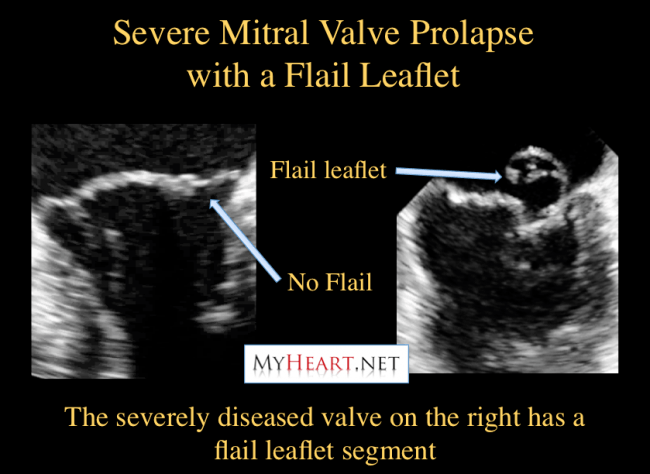 As can be seen in the video above the flail leaflet leads to severe failure of the valve and so it leads to severe leakiness, known as “torrential mitral regurgitation”. In many people this leak is so severe that it will lead to symptoms almost as soon as it happens. Remember, the valve is there in the first place to stop blood going backwards, allowing it to go forward to the body where it is needed. In flail leaflet the leak is so severe that typically over 50% of the blood in the heart will leak backwards. The body doesn’t like that! Particularly when it happens suddenly (for example a chord snapping) so of course symptoms from heart failure such as shortness of breath happen. These patients of course will need their valves fixed. There are some people however who have a flail leaflet and don’t have a lot of symptoms. In general, we still send those people with a flail leaflet to get their valves fixed for the reasons that the leak is very severe, the problem will likely only get worse and its generally accepted that those patients with flail leaflet will do worse unless the valve is fixed. Timing of surgery for advanced mitral valve disease is a controversial topic, we will discuss further in future posts. 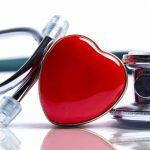 Mitral Valve Prolapse 2 – Whats happening to the valve? My 93 year old father, Jack Chinchen, received a mitral clip repair from you last June, 2017, and has returned to his home in Malawi, Africa. After the repair, there was still leakage because it was such a severe prolapse. His energy levels have greatly decreased and breathing is very labored. He has also developed a cough. In the opinion of people that live near him, “He has gone downhill 100%.” They will be back in the States next week. What would you suggest he do? Could he need oxygen therapy? If i remember correctly the aortic valve may also be an issue here and it may be time to get that addressed.